It's always a good idea to test the things before starting using them so that you 100% sure how it actually works, and also to be better prepared for your upcoming show! First of all, you need to create a broadcast. 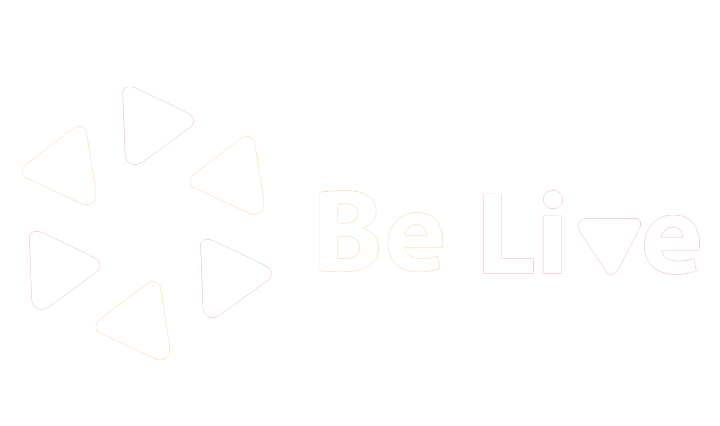 Please, go to belive.tv and click on the Start Broadcasting button in the middle of the screen (if the screen looks different you may want to log in to your BeLive account first). You will see different broadcast formats, so choose the desired one. There are 2 options how you can run a test, let's look in each of it! After you chose the format, the following window will appear, and that's exactly the right time and place to select the destination of your broadcast. 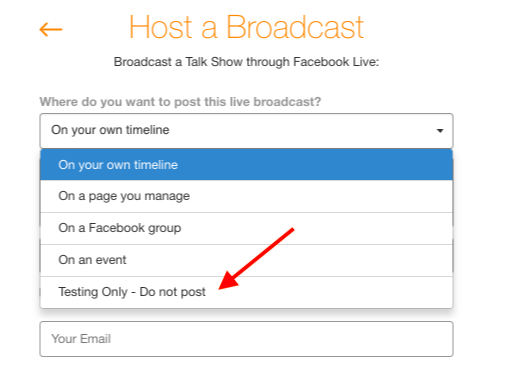 From the drop-down menu, you might want to select the Testing Only option, and your broadcast will never go live/be posted on Facebook. Also, you can add your branding (you can take a look on how to do that here). Once done, press the Create Broadcast button. Hey, you're in the broadcast section and good to start testing! As already mentioned, you won't be able to go live in the Testing Only mode. But no worries, there is also ANOTHER WAY on how to create a broadcast simulation that will be visible for you only! 1. 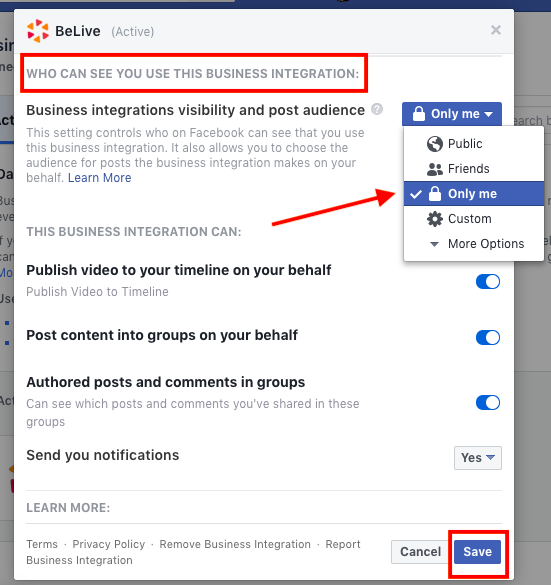 Go to your private account settings on Facebook, and find the Business Integrations. 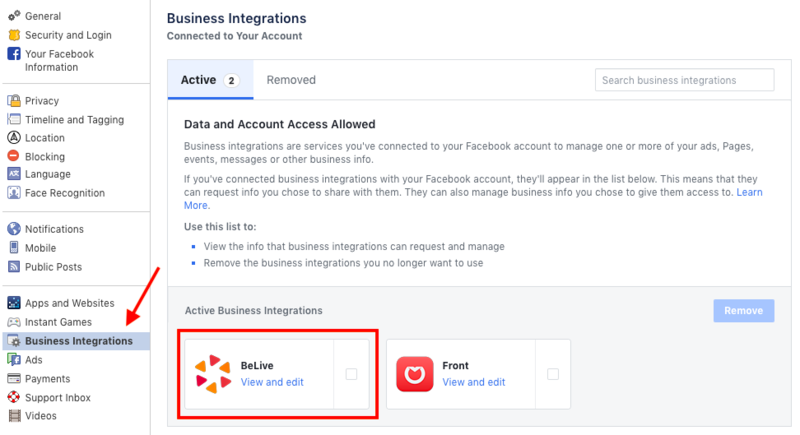 Sometimes, BeLive also may be located under the Apps & Websites. 2. Click on BeLive to open the settings. 3. Scroll down to the visibility setting, and set it up to Only me. 4. Do not forget to save the changes by pressing the Save button, and then you're done! After this, you can create a broadcast with a destination "On your own timeline" and actually go live to get a full experience while no one will see this broadcast. Do not forget to change the settings back to "Public" or "Friends" after you are done with the testing.